The DRC WASH Consortium, a programme of five international NGOs led by Concern Worldwide, has made the use of the life-cycle costs approach a central part of our approach to rural water supply. In February 2014, we organised the first workshops on life-cycle costs in DRC for over 50 participants from the sector with the support of IRC WASH. We developed a tool to facilitate the estimation of life-cycle costs and the ability of communities to cover these costs, based on an adaptation of a tool from the Global Water Initiative. In December 2014, the Consortium organised another sector workshop with over 60 participants on how to consider users as ‘clients’ not ‘beneficiaries’. Investments in rural water infrastructure in DRC are generally made without good information on what financing and technical support is required in the long term for the infrastructure to provide a sustainable service to the users. Given the under-developed policies and local government structures for water supply, the responsibility for organising and financing long-term operation, maintenance, and minor and major repairs is left to the users by default, usually through community-based water management committees. The DRC WASH Consortium is trying to address this issue by adapting the life-cycle costs approach (LCCA) to permit informed investment decisions by local actors which are based on an analysis of long-term economic, technical/environmental and social/institutional feasibility. 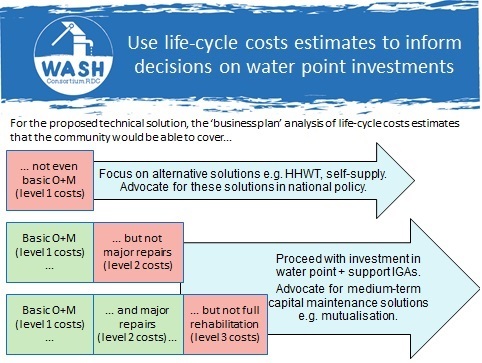 This paper explains how the Consortium has developed this approach so far, the lessons learned, and recommendations for other WASH sector actors implementing the life-cycle costs approach. What Theories of Change apply in the water sector? However, Triple-S and the Impact and Learning team are now reviewing progress to see if these Theories of Change need to be revised, and should be reporting back next week. Rural water services after 2015: what vision should replace the MDGs? Is Mali in the sustainability ‘danger zone’? I’m back in London for a few months, and gave a presentation to staff in the WaterAid office here last week on progress made by WaterAid and its partners in Mali in using WaterAid’s Sustainability Framework to analyse and address the challenges in developing sustainable rural water services. 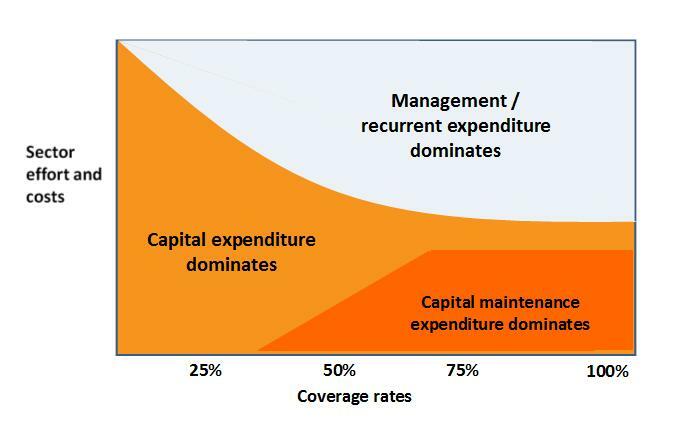 To illustrate one of the key challenges – finding the balance between financing new investments to increase access to water services, and financing ongoing costs to keep services running – I adapted a diagram developed by the Triple-S and WASHCost projects for a presentation to the World Bank last year. … this is the myth that there is an inherent demand for ‘clean’ drinking water in rural areas. In my experience there isn’t. There is a demand for water – of course. There is a demand for convenient water (that you don’t have to march for miles lugging a jerry can to collect). There is demand for (no adjective added) drinking water. And for livestock water. And for irrigation water. And for business water. And much of this demand is well captured in myth no. 4 – “what rural dwellers need is 20 litres per person per day of clean water”. Which makes the point that actually people need far less than 20 litres of clean water (probably only about 5 for actual drinking and cooking) and quite a bit more for other uses. … But … the assumption is still there that there is demand for these 5 litres of clean water. And there isn’t – at least not always. Of course, from a public health perspective people need at least five litres of clean water. But without basic education and behaviour change interventions people do not demand it. WaterAid’s Sustainability Framework is clear that demand – and subsequent willingness by the users to pay certain costs – is the first element of the whole framework, without which everything else fails. So any intervention has to test that assumption of demand, and/or promote behaviour change to create the demand. The challenge is that testing demand is very difficult before the actual water service is up and running. Rural water infrastructure investments typically require an initial contribution to this cost from the users as a proxy for ‘demand’, but this is not necessarily a reliable indicator of their ability and willingness to pay over the lifetime of the service. … there is urgent need for: (i) consideration of other water requirements, such as for livestock and crops and how these needs can be better linked to requirements for clean drinking water; (ii) full consideration of household values with respect to water (particularly distance to source and reliability alongside water quality) and (iii) presentation and demonstration of real and affordable choices for household water supplies. This implies a significant effort on the part of service providers to understand what rural water users already do for themselves, and how ongoing external support can help them build on that – luckily these were key elements of the discussion sessions at the RWSN Forum on multiple-use services, post-construction support, and self-supply. I’ll follow-up on some of these later in the week, including getting started on one of the crucial questions: if better external support is needed to promote demand, support multiple-use services and improve sustainability, how much does this support actually cost?